Listening to our community over these last years, it is clear that our mission to share the gifts of grateful living has a particularly meaningful place in the lives of those who are dealing with loss and grief, in their many and varied forms. Whether our hearts are heavy with the loss of someone important to us, the loss of aspects of our own lives, or the losses we feel in – and for – the world around us, Gratefulness offers itself as a sanctuary. In response to what we hear as a calling in our community and the world right now, we have created a dedicated space within our website where a wide variety of resources addressing Grief and Loss have been organized and can now be easily found. It is our intention to continually expand and enrich this area of focus. To send as an eCard, click on the image above. We are, and will be, here to provide a holding and healing space; an unconditional, warm welcome 24 hours per day, every day of the year for the tender-hearted around the world. Some come to light candles, some to read stories of others coping with broken hearts, some for inspiration as they navigate a terminal or chronic illness, some for guidance as they grieve, some for inspiration to navigate another day, and some for connection and community. 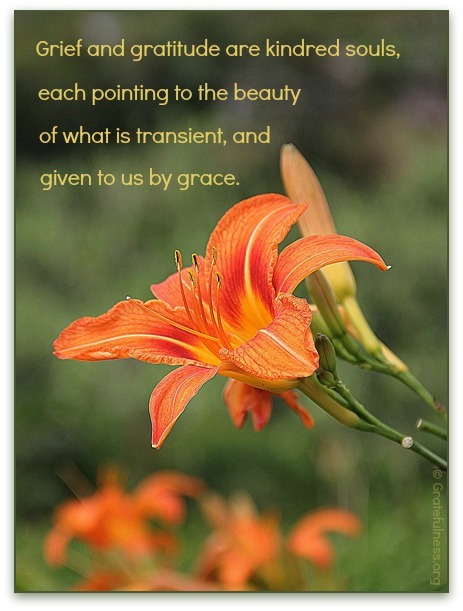 All come seeking the sense of grace, encouragement, resilience, and perspective that gratefulness can offer. May this be a place to sink safely into the truth of your tender heart. Our hope: May this be a place to sink safely into the truth of your tender heart. May this be a harbor where you feel comforted in your unique challenges and reminded of your connection to your larger human family. May gratefulness offer a sanctuary where grief and gratitude hold one another in close communion, and where you are reminded that you are always at home. What a blessing and feeling of true gratefulness I feel for those who offer such a place of healing. Each person that has spoken to me has had a part in lifting me to stand and supporting with their love to walk through my grief. I will forever give thanks for all of you. You all have been my Shoes. It is a privilege to be a small part of this effort to hold space for the brokenhearted, those hungry for inspiration and guidance and those salt of the earth pilgrims who take each day in stride and remember the blessings and grace which guide us in this journey. Thank you Gratefulness team. Thank you, dear Chuck. We are grateful to you for all that you do and are as together, we serve our vision of a peaceful, thriving and sustainable world held as sacred by all. To all on the Gratefulness Team, when I say thank-you so very much for your inspirational, comforting, uplifting site, I hope you can read between the words to what my heart is expressing. The energy that comes through this site is so beautiful and peaceful! Bless you.